Images - Pantomime Productions & Royal Children's Hosp, Melb. If you haven't been to the Snow White & The Seven Dwarfs Fundraiser by Pantomime Productions, you have but four days left to enjoy the show and give to a worthy cause. Get your $20 tickets HERE. Dads and kids under 2 go FREE, however if your heart is moved by this appeal, you can still purchase tickets to give to a good cause. You can also call 0422 363 418 to make your bookings. Shows are performed at St John's Anglican Church Hall, 5-7 Finch St, Malvern East. Doors Open 30 mins before the start of the show. Show dates are from Mon 15 to Thur 18 April 2019 with 2 shows each day from 10.30am to 12pm and 1.30pm to 3pm. What a great way for kids to experience theatre while helping other kids. Head to Pantomime Productions Facebook page and tag someone under their 4 April 2019 (1.59pm) post. You must also 'LIKE' and 'SHARE' the post. You could WIN 4 tickets to their July show, The Old Woman who lived in a Shoe. A WINNER will be picked at the end of the April School Holidays. Who doesn't love this Grimm Fairytale of an innocent stepdaughter, and a wicked queen, so jealous of her beauty, she orders the death of Show White. 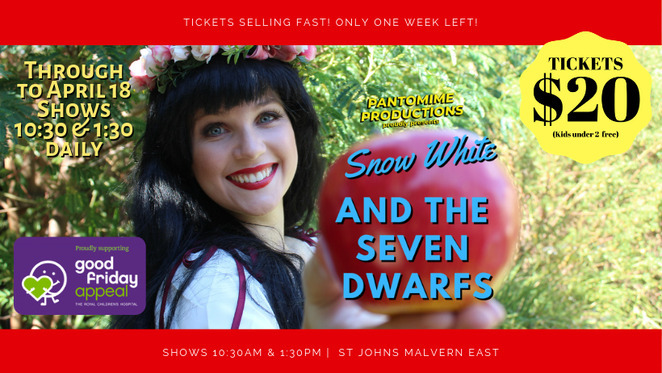 Escaping death and hiding in a cottage with seven friendly little dwarf miners, the Queen comes for her again with a poisoned apple that puts Snow White into a death-like sleep that can only be broken by a kiss from a prince. This FUNDRAISER event is for the Good Friday Appeal which is an annual event that raises much needed funds for The Royal Children's Hospital in Melbourne for equipment, research and education. It brings together people from all parts of the community and all walks of life, who put in year round effort, giving of their time, expertise and creativity; organising fundraising activities throughout the year. 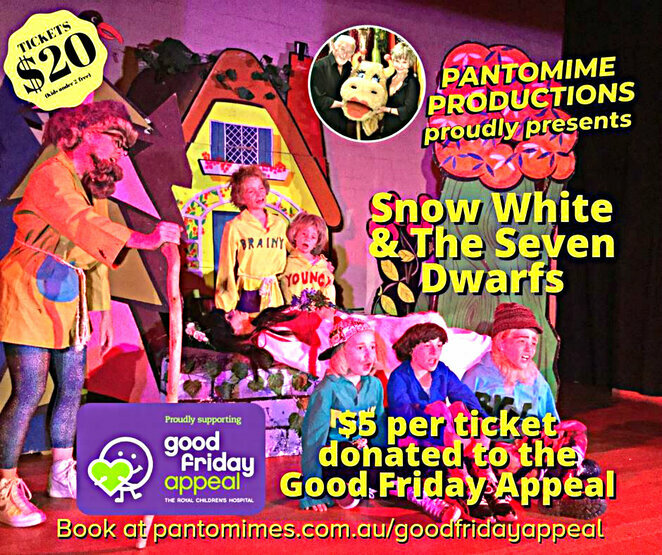 You too can be proud to be a part of this great and noble effort for the kids simply by attending Snow White and having a good time. 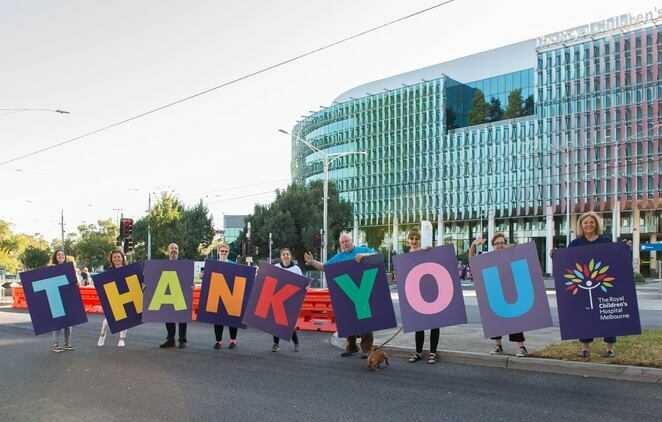 Perhaps you could also check out other Good Friday Appeal events, all happening on Friday 19 April 2019. Click on the links below for more information. Good Friday Appeal Kids Day Out 2019 - 10am to 5pm at MCEC. Good Friday Appeal Kick for the Kids 2019 - 4.20pm to 7.20pm at Marvel Stadium. Good Friday Appeal 'Do It for the Kids' Evening Show - 7.30pm to 11.30pm at The Plenary.